Giorgio Tavecchio (born July 16, 1990), nicknamed "Italian Ice" is an Italian-born American football placekicker for the Atlanta Falcons of the National Football League (NFL). He was born in Milan, Italy and was signed as an undrafted free agent by the San Francisco 49ers in 2012. He played his collegiate career at the University of California-Berkeley. Tavecchio's original plan was to attend UC Davis after they offered him a soccer scholarship. Because UC Davis was not also interested in him as a football place kicker, he considered other options. He then set up a workout at Cal but was only offered to be a walk-on. 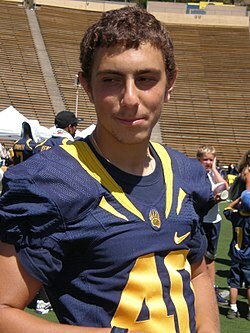 Tavecchio began attending Cal in 2008 and competed with David Seawright and Jordan Kay to be the team's placekicker. As a freshman, he split time with Seawright and converted all 25 extra point attempts and 9-of-13 field goal attempts. As a sophomore in 2009, he competed with Vincenzo D'Amato for the placekicking duties. With D'Amato handling a majority of the work, Tavecchio converted 14-of-15 extra point attempts and 8-of-12 field goal attempts. As a junior in 2010, he handled all of the placekicking duties and converted 37-of-39 extra point attempts and 11-of-16 field goal attempts. Throughout his first three seasons, he posted a 68% field goal percentage and was able to reach 75% after his senior year. In his final collegiate season in 2011, he continued to handle all placekicking duties and converted 36-of-42 extra point attempts and 20-of-23 field goal attempts. In his senior season, he had his best statistical kicking performance against Arizona State in a 47–38 victory. In the win over the Sun Devils, he converted all five extra point attempts and all four field goal attempts. His 20 field goals made in the 2011 season led the Pac-12 Conference. During his time at Cal, he was a four-year starter. Going into the draft, Tavecchio was not invited to the NFL Combine. During the California Golden Bears pro day, it began to rain before he was able to perform any drills. Tavecchio kept running his planned drills but was unable to showcase his talents since every NFL scout had gone into an indoor practice facility. Tavecchio remained unsigned after going undrafted in the 2012 NFL Draft. He then attended a tryout for the San Francisco 49ers at which he was the only kicker present. On August 29, 2012, Tavecchio signed a three-year, $1.44 million contract with the San Francisco 49ers. At the time, 49ers special teams coach, Brad Seely was looking for an additional kicker to eventually succeed long-time veteran David Akers. The left-footed Tavecchio was chosen because Akers was also left-footed and they could both use the same holder, instead of getting another holder for a right-footed kicker. After being waived by the San Francisco 49ers during the offseason, the Green Bay Packers signed him to a three-year, $1.48 million contract on March 26, 2013. Tavecchio was waived by the Packers on August 26, 2013. The Detroit Lions signed Tavecchio to a reserve/futures contract on January 1, 2014. The Lions waived him on August 25, 2014. On August 27, 2014, the Oakland Raiders claimed Tavecchio off of waivers. Three days later, he was waived by the team. On February 23, 2015, Tavecchio signed a contract to return to the Raiders. He was waived by the team on September 5, 2015. On January 5, 2016, the Raiders signed Tavecchio to a two-year, $990,000 reserve/futures contract. On August 29, 2016, he was released by the Raiders. On April 19, 2017, Tavecchio again signed with the Raiders. He was waived by team on September 2, 2017 and was later signed to the practice squad. He was promoted to the active roster on September 9, 2017 after longtime Raiders kicker Sebastian Janikowski was placed on the injured reserve list with a back injury. Tavecchio played his first game on September 10, 2017, where he scored four field goals on four attempts, including two 52-yard attempts, and two extra points on two attempts, providing over half the scoring in a 26–16 victory over the Tennessee Titans. He tied with Los Angeles Rams' kicker Greg Zuerlein for the most points scored by a kicker in Week 1 with 14. He became the first player to hit two 50-plus yard field goals on his debut in NFL history. Tavecchio's performance in Week 1 earned him AFC Special Teams Player of the Week. In the next game, a 45–20 victory over the New York Jets, he had a season-high six extra points converted to go along with a 29-yard field goal. Overall, he finished the 2017 season with 33-of-34 extra point attempts converted to go along with 16-of-21 field goals converted in all 16 games. On August 3, 2018, Tavecchio was waived by the Raiders after the team signed veteran kicker Mike Nugent. On August 27, 2018, Tavecchio was signed by the Atlanta Falcons. He was waived by the team on September 1, 2018.. He was re-signed by the team on October 10, 2018, after incumbent kicker Matt Bryant injured his hamstring after kicking a 57-yard field goal the previous week. In Week 7, Tavecchio was a perfect 2 for 2 on extra points and 3 for 3 on field goals, including a career long 56-yarder, in a 23-20 win over the New York Giants, earning him NFC Special Teams Player of the Week. ^ "Former Cal kicker Giorgio Tavecchio signs with Raiders". San Jose Mercury News. February 24, 2015. Retrieved April 16, 2016. ^ Della, Luke. "GIORGIO'S JOURNEY". University of California Athletics. Retrieved August 30, 2017. ^ "2008 California Golden Bears Stats". College Football at Sports-Reference.com. Retrieved June 4, 2018. ^ "Giorgio Tavecchio 2008 Game Log". College Football at Sports-Reference.com. Retrieved June 4, 2018. ^ "2009 California Golden Bears Stats". College Football at Sports-Reference.com. Retrieved June 4, 2018. ^ "Giorgio Tavecchio 2009 Game Log". College Football at Sports-Reference.com. Retrieved June 4, 2018. ^ "2010 California Golden Bears Stats". College Football at Sports-Reference.com. Retrieved June 4, 2018. ^ "Giorgio Tavecchio 2010 Game Log". College Football at Sports-Reference.com. Retrieved June 4, 2018. ^ "2011 California Golden Bears Stats". College Football at Sports-Reference.com. Retrieved June 4, 2018. ^ "Giorgio Tavecchio 2011 Game Log". College Football at Sports-Reference.com. Retrieved June 4, 2018. ^ "Giorgio Tavecchio College Stats". Sports Reference. Retrieved August 30, 2017. ^ "California at Arizona State Box Score, November 25, 2011". College Football at Sports-Reference.com. Retrieved June 4, 2018. ^ "2011 Pac-12 Conference Leaders". College Football at Sports-Reference.com. Retrieved June 4, 2018. ^ "Giorgio's Journey - California". University of California Athletics. Retrieved June 4, 2018. ^ Gehlken, Michael. "Raiders K Giorgio Tavecchio still chasing dream after 6 NFL camps – Las Vegas Review-Journal". Las Vegas Review-Journal. Retrieved August 30, 2017. ^ Fucillo, David (November 28, 2012). "49ers kicker: Team works out Billy Cundiff, Nate Kaeding, according to reports". SBNation. Retrieved August 30, 2017. ^ Luke Della. "Giorgio's Journey". CalBears.com. Retrieved July 8, 2016. ^ Western, Evan. "Packers Sign Tavecchio, But Is This Kicking Competition Real?". SBNation. Retrieved August 30, 2017. ^ Silverstein, Tom. "Packers release Tavecchio, keep him on short list". Milwaukee Journal Sentinel. Retrieved August 30, 2017. ^ Twentyman, Tim. "Lions sign 10 players to futures/reserve contracts, including two kickers". Detroit Lions. Retrieved August 30, 2017. ^ "Detroit Lions cut Giorgio Tavecchio, settle on Nate Freese". ESPN.com. Retrieved August 30, 2017. ^ Hjeltness, Nick. "Oakland Raiders Once Again Sign Kicker Giorgio Tavecchio". SBNation. Retrieved August 30, 2017. ^ "Oakland Raiders Kicker, Punter & Snapper News". Blogger. Retrieved August 30, 2017. ^ "Oakland Raiders Announce 53-Man Roster". Raiders.com. September 5, 2015. Retrieved April 19, 2017. ^ "Giorgio Tavecchio Contract". Sportrac.com. Retrieved July 8, 2016. ^ "Oakland Raiders Announce Transactions". Raiders.com. August 29, 2016. Archived from the original on September 9, 2017. ^ "Raiders Sign K Giorgio Tavecchio". Raiders.com. April 19, 2017. ^ "Raiders Announce Transactions". Raiders.com. September 2, 2017. Archived from the original on December 9, 2017. ^ "Oakland Raiders Sign Kicker Giorgio Tavecchio To Practice Squad". =Raiders.com. September 8, 2017. ^ "Raiders Sign Giorgio Tavecchio; Place Sebastian Janikowski On IR". Raiders.com. September 9, 2017. ^ "Player Game Finder Query". Pro-Football-Reference.com. Retrieved October 13, 2017. ^ Lam, Quang M. (September 13, 2017). "Alex Smith, Sam Bradford among Players of the Week". NFL.com. ^ "Oakland Raiders at Tennessee Titans - September 10th, 2017". Pro-Football-Reference.com. Retrieved September 26, 2017. ^ "2017 NFL Week 1 Leaders & Scores". Pro-Football-Reference.com. Retrieved June 4, 2018. ^ "New York Jets at Oakland Raiders - September 17th, 2017". Pro-Football-Reference.com. Retrieved June 4, 2018. ^ "Giorgio Tavecchio 2017 Game Log". Pro-Football-Reference.com. Retrieved June 4, 2018. ^ McFadden, Will (August 27, 2018). "Falcons sign former Raiders kicker Giorgio Tavecchio". AtlantaFalcons.com. ^ McFadden, Will (September 1, 2018). "Falcons 2018 roster: Atlanta announces roster cuts, trims active roster down to 52". AtlantaFalcons.com. ^ McFadden, Will (October 16, 2018). "Falcons sign kicker Giorgio Tavecchio". AtlantaFalcons.com. ^ "Cam Newton, Aaron Donald among Players of the Week". NFL.com. October 24, 2018. Wikimedia Commons has media related to Giorgio Tavecchio.